Loop Joins, More rows on top or bottom? I’ve seen this question come by in the web searches multiple times. The nested loop join is also called an iterative join. This is because it takes the rows from the inner part of the join and compares them through an iterative process (one-by-one) to the rows in the outer part of the join. 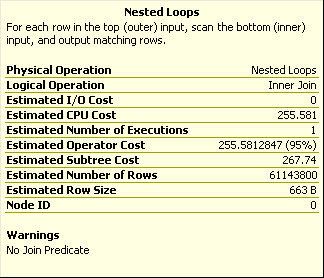 So, if the optimizer has correctly chosen this operation for your query, you should see FEWER rows in the top, or outer, part of the join and MORE rows in the bottom, or inner, part of the join. This is a classic loop join. Now, if you see a loop join that’s reversed, with more rows on top or one where the same number of rows are on both sides of the join, that’s worth checking out as a problem. It could be missing or incorrect indexes, or, more likely, bad or out of date statistics. Do a statistics update, maybe with a full scan to see if that fixes the problem. Update #2: As was pointed out in the comments below, I had the outer & inner labels swapped. I’ve updated the text to reflect the correction.